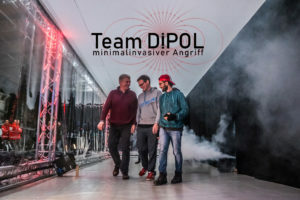 Team Dipol is the Teutonic team with unfinished business. William Thielicke, Klaus-Peter Neitzke and Ruben Jubeh, runner-ups in DroneClash 2018, have invested in their return ticket to Katwijk’s Hangar 2. March 16th 2019 is circled in their calendars. After having been defeated in 2018 by devilish Dutch rivals, the Laced Horns, this trio of drone-enthusiasts is in it to win it. And by “it”, they don’t mean the €30,000 in prize money (although that would be nice). 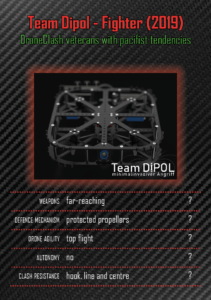 For Dipol, “it” is more about the satisfaction of seeing their counter-drone ideas put to the test. And believe me, they have quite a few of these ideas up their sleeves! But ask Dipol about their plan of attack and you won’t get far. Attacking is not Dipol’s style. In fact their motto is strangely pacifist in spirit: “Minimalinvasiver angriff” (a play on the idea of “minimal invasive surgery”) is roughly translated as “minimal invasive attack.” So what can we expect? Keyhole conflict and homeopathic hostility? 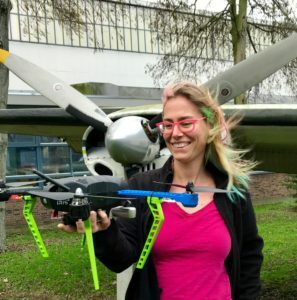 A soft landing for opponent drones? Take their prototype fighter drone, for example. Our Dipol Top Bump card reveals its impressive bulk. Measuring a substantial 400x300x100mm and weighing in at a bulky 600g, the theory is that this fibreglass-constructed drone will take down smaller aggressors with relative ease. Beyond the impressive stature of their drones, William and his fellow UAV-enthusiast side kicks, are also hard at work developing secret mechanisms to be activated mid-clash. Despite fishing for details, William is keeping quiet. The team is eager to catch out their opponents and save an element of surprise for the day itself. Join us to on March 16th to see William, Ruben and Klaus Peter, going for gold.